Climate improvements. 85 % less CO2 emissions. Preventing pruned vine shoot burns will reduce CO2 emissions. The addition of organic matter will prevent soil degradation, increasing its capacity for carbon storage, biodiversity and providing higher resilience to Climate Change. Improvement of fields, vineyards and wines. Less harmful for the environment. Replacing chemical fertilisers with bio-fertilisers, thus reducing the contamination of ground waters caused by nitrate leaching from chemical fertilisers. Improvement of waste management. By-products generation. By the end of the project, 750ha of vineyards will be managed, generating 650m3 of enriched compost with different applications and offering a feasible alternative to burning. · Development of a logistic plan to select and collect pruned vine shoots from the plots to the collection and transformation areas, as adapted to the characteristics of each plot and providing high accuracy to minimize transport emissions. · Construction of a composting plant. · Initial training to farmers and specialists involved in the project. Identification of plots where pruned shoots will be collected and test plots where compost will be applied to the soil. Location of collection areas and place where compost will be produced, minimizing transport and avoiding protected areas. Involvement of farmers and signing of collaboration agreements. This action consists in the implementation of the vine pruned shoots management system, following the logistic plan previously developed in Action A1, from its production in plots to its transformation and preparation as final product according to its different final applications. · The production of a substrate/organic amendment ready to use from pruned vine shoots, avoiding its burning and emissions related to its current management. · The reuse of cellar wastewater, reintroducing it into the productive system. · The development of a management process that will showcase to other stakeholders how to deal with pruned shoots and allow for the right performance of monitoring actions. · As organic amendment in vineyards, bringing the organic matter back to the plots where it was previously extracted. The monitoring and control actions will assess the improvement in soils and crops, especially from the third year onwards. · As substrate for urban orchards, starting by those in Bullas municipality, where this substrate will be provided and farmers will be supported. This activity has a great potential for dissemination to the general public and is foreseen to be spread to other areas with urban orchards. · As plant nurseries substrate, both in vegetable seedbeds, where it will be compared to commonly used growing media, and in forestry nurseries. These actions seek to demonstrate that, beyond the environmental benefits, the resulting output improves the action of other commonly used substrates in agriculture. Partners will actively work with farmers and specialists, not only to assess them in the management of the product but also to collect their feedback and input and streamline the process. · Management: CO2 emissions, managed wastes, etc. Composting process and characterization of organic substrate/amendment. 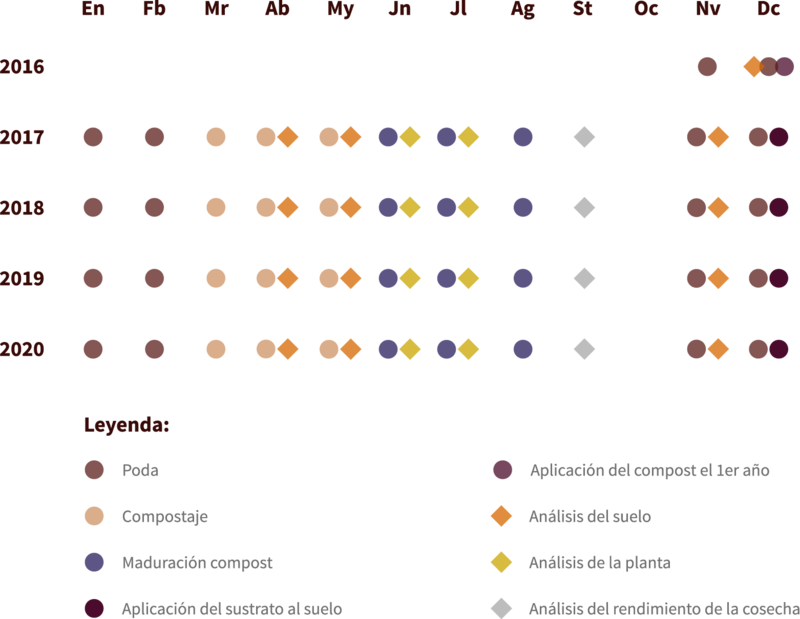 · Impact on soil, evaluating its physic-chemical status and biodiversity, and on plants, assessing response and productivity. · Environmental status, focusing on soil status improvement and its biodiversity, as well as risks related to current farming practices. · Climate Change mitigation, assessing CO2 emissions balance related to the change of the management system, and including the increase of carbon storage and the reduction of the mobilization of carbon related to the use of peat substrates. · Climate Change Adaptation, assessing the increase of soil resilience. Data on managed waste and quantity and quality of the produced compost. Knowledge on the response of plants, soil and production to the addition of compost to soil. Contribution to the objectives of climate change mitigation and adaptation. Assessment of the social perception of the project. The main objective is to provide the tools and resources to get a successful communication activity as well as transfer and replicate the management project in other areas that implement and develop the system. The success of the project depends on the correct dissemination of the information to the different stakeholders. This action will implement all those dissemination actions that involve interaction with other stakeholders such as awareness-raising and information activities and networking with other projects and activities. Leaflet, newsletters, noticeboards, video and web page. Organization of workshops and visits. The main objective of this activity is setting up a management and coordination structure that ensures the correct implementation and development of the project in all financial, administrative and technical terms. Technical and financial progress and final reports. The information you provide in this form will be used to sign you up in our newsletter. You can unsubscribe at any time by clicking the link in the footer of our emails. For information about our privacy practices, please visit política de privacidad. By clicking below to subscribe, you acknowledge that your information will be transferred to Mailchimp for processing. This website has been done with the financial support of the European Union within the framework of the LIFE programme. The contents are the sole responsibility of the project LIFE SARMIENTO and in no case it should be noted that reflects the position of EASME and that this agency is responsible for the use that can be made of the information contained.